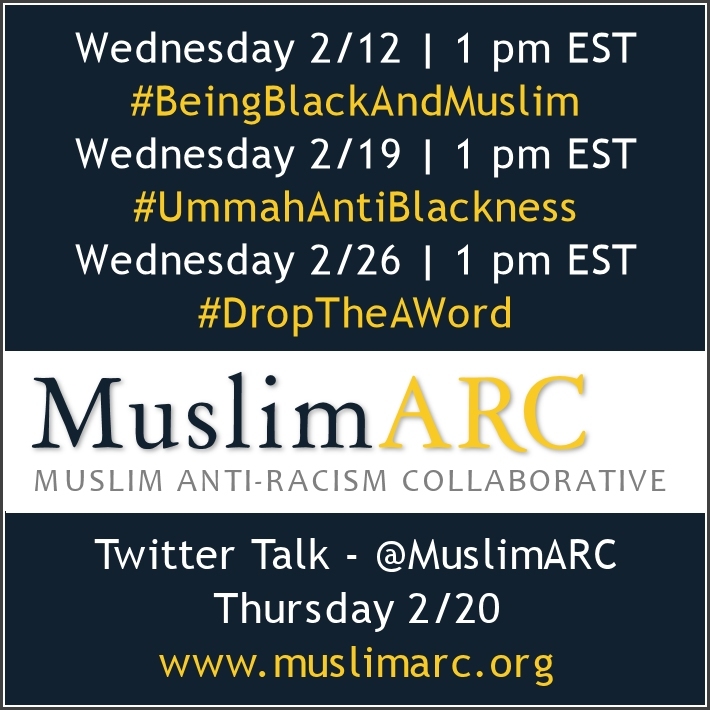 Throughout the country, Muslims of all stripes have honored Black History month, recognizing the contribution of Black Muslims to the ummah (Muslim community).We’ve shared a lot this month, in #UmmahAntiBlackness we examined stories and accounts of anti-Black racism in Muslim majority societies. One of the themes that came up in #BeingBlackandMuslim was the pain some Black/African Muslims as they experienced racism. It is not uncommon for Arabs from the Levant to refer to Blacks as abeed (slaves). In the South Asian community, Blacks or people with darker skin are sometimes referred to negatively as kallu (Black person). In the Somali community, it is also not uncommon to hear other Blacks being called jareer (nappy head) and adoon (slave). And even among some Nigerians and Ghanaians, there is widespread usage of the word akata (wild animal) to describe descendants of their former enslaved tribesmen who are Americans. Sahih International: O you who have believed, let not a people ridicule [another] people; perhaps they may be better than them; nor let women ridicule [other] women; perhaps they may be better than them. And do not insult one another and do not call each other by [offensive] nicknames. Wretched is the name of disobedience after [one’s] faith. And whoever does not repent – then it is those who are the wrongdoers. This verse reveals that even if you think it is cute to use the n-word and you don’t mean it offensively, it is something that Allah Subhan wa ta’ala considers wrong. Even if you don’t think the subject of your offensive nickname is not offended, you have offended someone else. Someone like me, felt the full brunt of the violence behind those words. As a child, I was attacked by a bully, had a plug of my hair ripped out my head and called the n-word. I asked an old man for the time and was told, “I don’t speak to N—s!” I grew up hearing the jokes in the back of the class, and that experience was crushing. 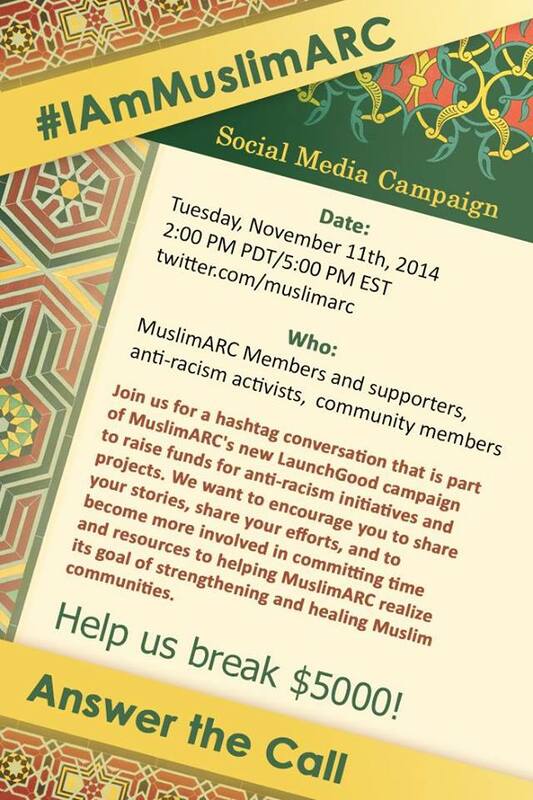 For years, I didn’t know Muslims used anti-Black slurs. Then when I slowly discovered them, I heard embarrassed apologetics. But what really bothered me was that many Muslim schools were not well equipped to deal with racism on their campus. 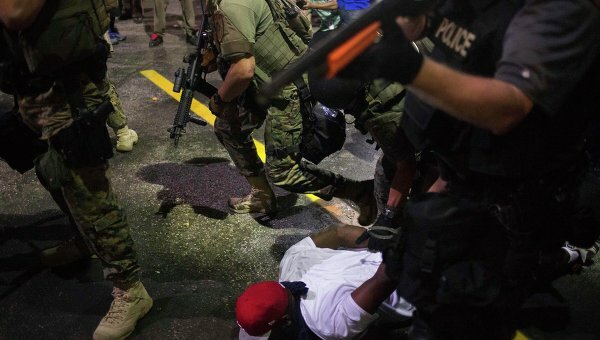 One can be actively racist, passively racist, actively anti-racist, but you can’t be passively anti-racist. I spent months calling out people on twitter for using the word abeed. Many questioned our methods. And this work, itself angered me, frustrated me, and made me wonder was it worth it. I still believe that there is a place for calling out foul behavior. This study shows that regardless of the resistance or hostility people expressed when confronted on the their stereotypes, they are less likely to express prejudiced views afterwards. But I don’t think it should be the job of the victims of prejudice to call out the perpetrators. You need to check your own people and do it out of love for them because it is cutting away from their humanity. 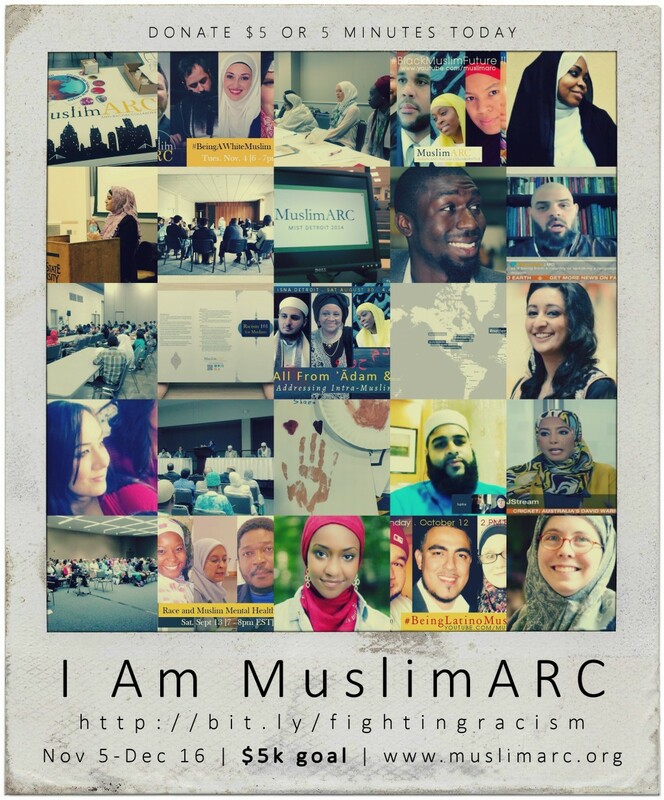 There are many methods that we can take to confront racism and stop our Muslim community centers, Islamic schools, camps, and outreach programs from becoming toxic, ethnically and racially polarized spaces. We still have to explore the best methods and see which ones would be the most effective. Regardless, we have to stick to the Qur’anic injunction of enjoining the good and forbidding wrong. It is time for our community to say this is unacceptable and incompatible with the spirit of Islam. 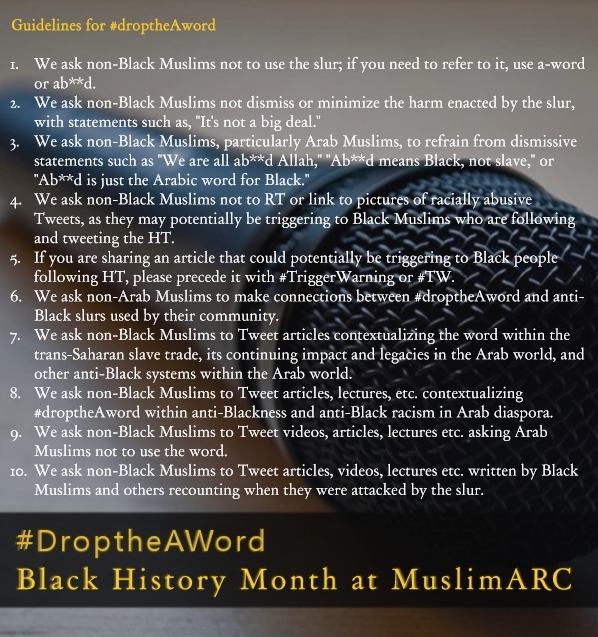 We’re calling on our co-religionists to take a stand against the use of anti-Black slurs (and all racial slurs), whether in English or in other languages including those of their fore bearers. Wednesday February 26, tweet your thoughts on ways we can #DropTheAWord. We know better, we must do better, and it is up to each of you to do your part.